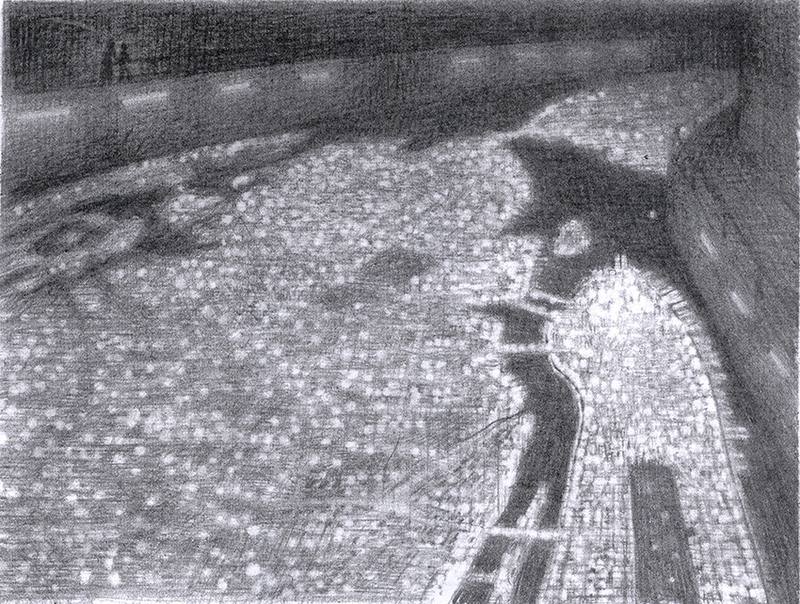 Wonderstruck in the Panorama: Drawings by Brian Selznick parallels the preparation of the author/illustrator’s latest novel, Wonderstruck, with the construction of the Panorama of the City of New York at the Queens Museum of Art, a mythical location steeped in nostalgia. From its beginnings as the main attraction of the New York City Pavilion at the 1964-65 World’s Fair to its contemporary role as a crowd pleasing destination for museum visitors of all ages, the Panorama has served as muse, impetus for reflection, and an idyllic escape. For Brian Selznick, bestselling children’s book author, artist, and Caldecott Award Winner, it proved to be a locus of memory and he cast the Panorama as a leading character in Wonderstruck, released by Scholastic Press, Inc. on September 13, 2011. In conjunction with the release of the book, and marking the culmination of an ongoing collaboration with Selznick, the Queens Museum of Art presents Wonderstruck in the Panorama: Drawings by Brian Selznick, featuring 29 drawings, maquettes, and storyboards that so magically capture the expanse of the Panorama, the experience of viewing it, and the process of writing about it. This exhibition is mounted on the walls overlooking the Panorama with original artifacts and photographs documenting the design/construction process by the great architectural model makers Raymond Lester Associates in the three years before the opening of the fair. Wonderstruck in the Panorama: Drawings by Brian Selznick has been curated by Louise Weinberg, Collections Manager. The Queens Museum of Art is overwhelmingly indebted to Brian Selznick for his passion, persistence and wondrous imagination shaping the origins of this exhibition. Thanks to Kenny Greenberg of Krypton Neon LLC, Irene Young and Arnold Kanarvogel for exhibition signage design/construction. Wonderstruck in the Panorama: Drawings by Brian Selznick is supported in part by the New York City Department of Cultural Affairs and New York State Council on the Arts.